This week is, of course, Banned Books Week. It’s one of my favorite weeks of the year. Nothing gets me in a tizzy faster than discussing the ignorance of banning or challenging books. I think few things demonstrate a narrowness of mind more than the reasons behind challenging books. I’ve read news articles over the years of school across the country attempting to remove one book or another from said school’s curriculum and/or library based on complaints from teachers and/or parents and/or random people in the community. Their reasoning is never sound and in some cases, the people voicing the complaints haven’t even read the book. They are simply basing their complaint on the opinions of others. It’s maddening. In celebration of Banned Books Week, I usually choose a book or two from the challenged lists published by the ALA. This year, I’m rereading Saga Vol 1 (because it’s been so long since I’ve first read it) and Saga Vol 2. by Brian K. Vaughan and Fiona Staples. I’d also like to try and fit in Brave New World by Aldous Huxley but with my school schedule and the books that I’m already reading, I might not have the time. Please!! 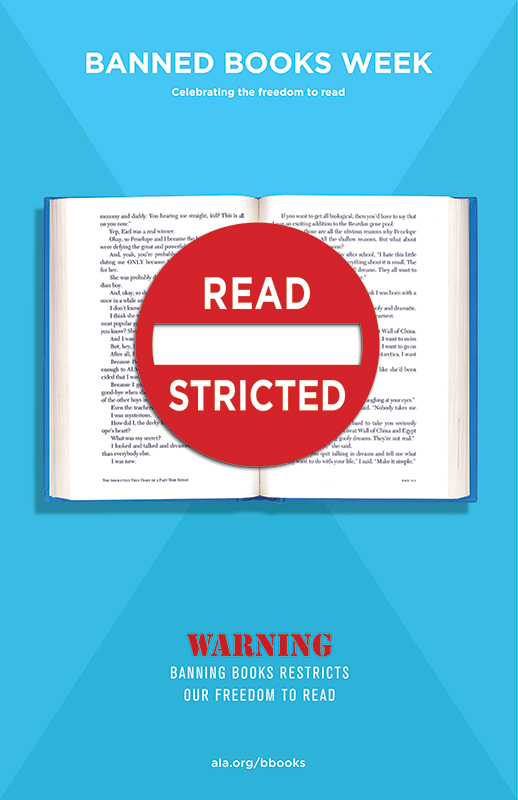 Take part in Banned Books Week by spreading the word, changing your Facebook profile picture, reading one of the books on the challenged lists, or just discussing the pros (if you can find one) and cons of challenging books with someone else. Raise awareness as to why removing books from libraries and schools impedes education. Help others to realize why you should read a book critically before judging it and deciding if it’s offensive in some way. The only “pro” I can think of to challenging a book isn’t a “pro” for the person challenging it, but…. it definitely boosts the books popularity as more people are inclined to read it to see what’s worth banning in it. This is an excellent pro! Challenging books definitely gets the conversation started about them and increases readership. Most definitely the opposite results of what’s intended and I LOVE IT! I reblogged this (it’ll appear tomorrow) you said it so much better than me.